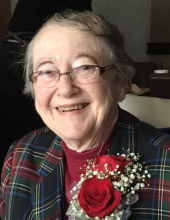 Ann Marineau, nee O’Leary, age 86 of Naperville, IL passed away peacefully on Saturday, April 13, 2019, at her home. She was born February 24, 1933, in Menominee, MI to her loving late parents, Lee and Jewell O’Leary. Beloved wife of the late Russell E. Marineau, wedded for over 59 years. Cherished mother of William "Bill" (DeeDee) Marineau, Nancy (John) Picton, Jane (Chris) Loan, Sue (Chris) Saar, and Lynn (Steve) Klein. Dearest grandmother of Russell & Joseph Marineau, Scott & Matt Picton, Megan & Kevin Saar, and Allison & Michael Klein. Fond sister of Joyce (the late John) Weston and the late Lee O’Leary and sister-in-law of Enid O’Leary. Dear aunt to many nieces and nephews. Ann was a 1951 graduate of Marinette High School and 1955 graduate of University of Wisconsin, Madison, receiving her degree in Education. She was a wonderful mother, who volunteered her time at her children’s school, swim team, Girl Scouts, and SS. Peter & Paul Church. In lieu of flowers, memorials to Diabetes Association, donations.diabetes.org/. Memorial Visitation: Wednesday, April 17, 2019 3:30 -6:30 PM at Friedrich-Jones Funeral Home & Cremation Services, 44 S. Mill St., Naperville, IL 60540. Memorial Service to follow at 6:30 PM at the funeral home. Interment is private. Future inurnment will be at SS. Peter & Paul Cemetery, Naperville, IL. To send flowers or a remembrance gift to the family of Ann O. Marineau, please visit our Tribute Store. "Email Address" would like to share the life celebration of Ann O. Marineau. Click on the "link" to go to share a favorite memory or leave a condolence message for the family.